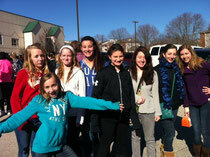 Women of Faith hosted the Revolve Tour on March 9, 2013 in Philadelphia. At this event, teen girls learn what it means to have their lives centered on Jesus and it seeks to inspire to them to make a difference in their generation. Eight young ladies from Daybreak participated: "Revolve was a great time of fun, worship and teaching about issues teens are facing these days. It got us all thinking about how God is for us and with us in the midst these challenges." Slideshow above is rendered in Flash which is not compatible with an iPad; iPad users must view at Google.